Retirement Plan, doing the math. This chart, which I first noticed in one of Mauldin’s Outside-the–box articles, captures the essence of QE and Central Bank policy very well and points to where some of the most unintended and underappreciated problems are going to surface in the future. 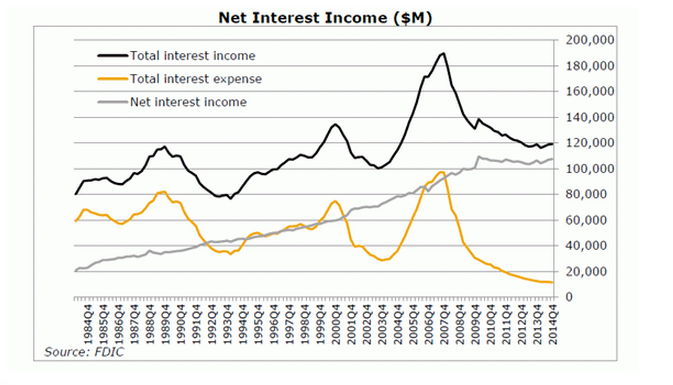 The chart is from the FDIC and shows what banks receive and pay in interest. Corporates and Governments as well as households are also large issuers of debt and are not featured in this chart but we will simple assume that this is a reasonable proxy for all debt (about 70 T, 2+X the total stock capitalization, about 40 T). When planning for retirement, either on a DIY or Institutional basis, your first task is to find the right mix. Traditionally this has roughly been 60%-$40% in favour of debt instruments as opposed to stocks. There are logical reasons for this having to do with the relative dependability of returns over long time periods. But, no doubt, the availability played into this ratio simple given the relative sizes of the stock and bond markets. Borrowers and investors must always be equal or the returns will simple adjust to make it so. Also not all investing is retirement related but it does all fall under “wealth” management. The intelligent reader (you can test yourself) will notice that I have left out the stock of housing which stands at about 27 T, still down a bit from 29 T at the peak. At first blush this seems to be a serious omission , particularly as this is an asset class that has often behaved better than the others (except in the US). However if you do include the house value you would have to put it together with the stock asset class which, in most cases, would mean that the retirement investor should only own bonds! So in our rough approach you can only chose between stocks or bonds. On BNN and everywhere else you will hear that on any given day money flowed out of bonds and into stocks (a risk-on day) or visa versa ( a risk-off day). This is complete rubbish as , collectively, this cannot possible happen. For the same reason it is impossible for investors as a whole to cash in on their stock gains over the past six years. Getting back to the chart you can see that income from bank deposits, earned by investors, has dropped from about 100 T per year to about 20 T. This has been true , on average, for about the last 5 years, representing a loss of, give or take 375% which would require a corresponding gain of 562% on stocks to balance out (using 60-40). In reality the broad US stock market is only marginally above its 2008 peak level. Interestingly banks have not been affected at all judging by the net interest income line. All this is based on the past 5/6 years. It takes time for bonds to mature but now that most have, and have rolled over at much lower rates, going forward things will be a lot worse. In fact it is not unreasonable to conclude that it will simple be impossible to get a decent return. Keep your government job as the defined pension plan may prove to be worth more than all your other income, over a lifetime, combined.